Here we go, on a quest amongst the stars of the cosmos. There's music to invigorate you to feel brave, getting you in the mood to explore other planets and soothing your fears about any scary sights to come. The music in this slot is actually quite decent and, I must admit I kept it on the whole time! Usually, my finger dives straight for the mute switch but, the extra-terrestrial creatures and weapons had their music to compliment them this time. As you spin, an eerie omnipresent twinkling sound pops up, like the inner workings of a spaceship, reeling you in with its promise of coins and treasures unexplored. 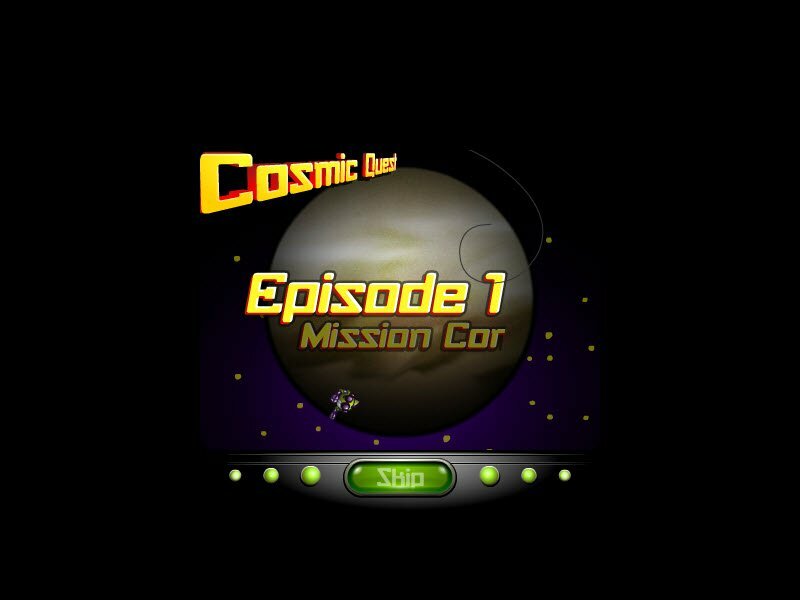 Overall the Cosmic Quest Episode 1 Mission Control slot software gets two thumbs up. the aim of the bonus game is to blast as many asteroids as possible to be rewarded with coins. With laser guns, spinning wheeled spaceships, astro-dogs in full gear, space castles, food in tubes (yuck! ), satellites and more, there is enough to keep your attention from wandering to the stars. 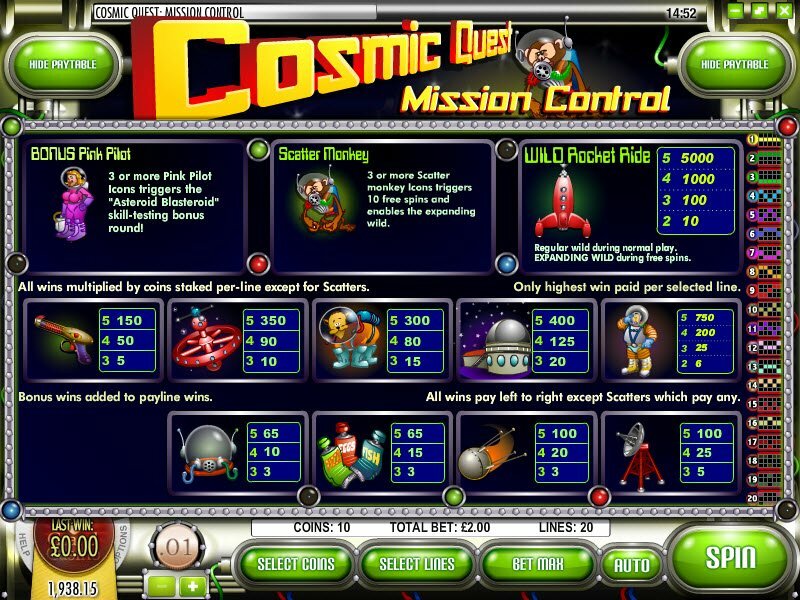 Graphics are decent, bright and colourful and, a lot of imagination has been put in behind this Cosmic Quest - Mission Control slot game. Your Mission Control bonus symbol is a pink pilot, 3 or more of these will trigger the Asteroid Blasteroid skill testing bonus round. This bonus round has five different stages, each has a different colour background atmosphere and a different type of rocket - the aim of the bonus game is to blast as many asteroids as possible to be rewarded with coins. Your ape in a spacesuit is the scatter monkey symbol and, reeling in three or more of him will result in 10 free spins and the expanding wild! 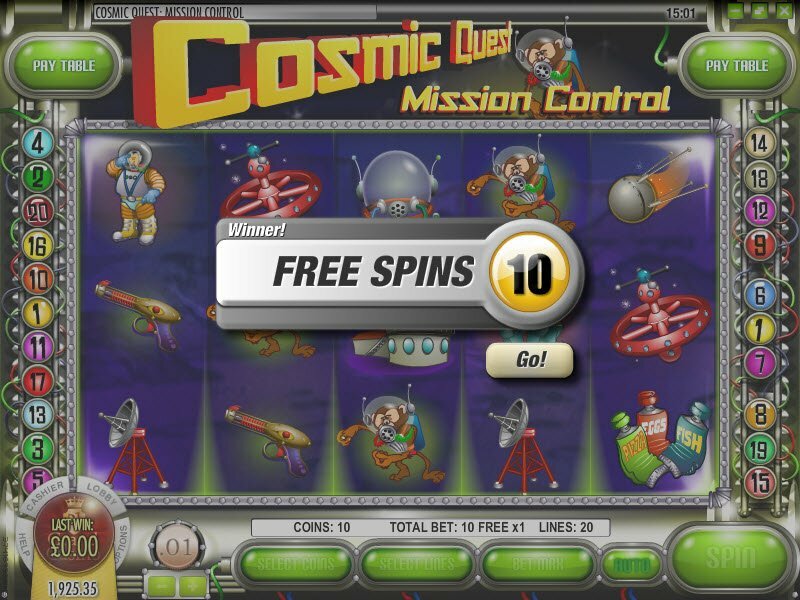 The regular wild is the Rocket Ride and, during times of the expanding wild, this rocket ride will take you on a wild ride that has to be seen to be believed, shooting the rocket to the very top of this 5 reel, 15 payline Cosmic Quest Episode 1 Mission Control slot game. -Cannot wait to find out what the sequel episode holds!